20 I WRAPS I 2015 B u s i n e s s & s a l e s P ricing your product in any type of business can be one of the most challenging aspects of starting or running a successful business. Here at Digital EFX Wraps we are constantly trying to convey to our customers the relationship between quality and price. Regardless of your company's location it's important to know what your competition is charging along with what niche your company caters to. We have been fortunate over the past eight years to train the industry on design, print, marketing, production, and installation. 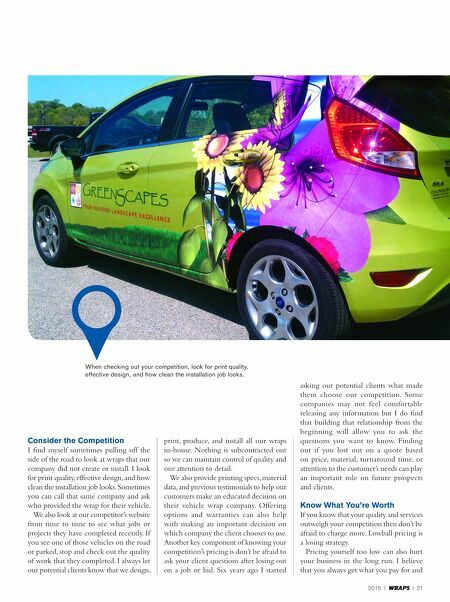 One of the most common questions or topics is "How do I price vehicle wraps properly?" I have found that the area or location of your business can play a big part in your pricing structure. Obviously if there is a lot of competition, pricing can be driven down because of supply and demand. We have more competition than ever before, and that requires us to constantly educate our customers (and ourselves). It's very important to get a pulse on what your competition is charging along with the level of service and quality they provide. This will hopefully allow you to compare apples to oranges. 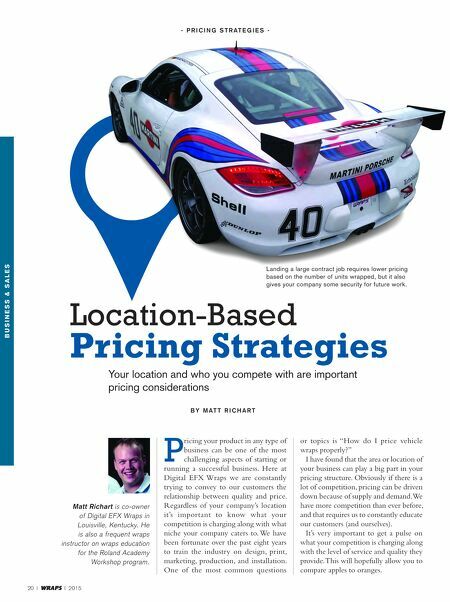 Your location and who you compete with are important pricing considerations Matt Richart is co-owner of Digital EFX Wraps in Louisville, Kentucky. He is also a frequent wraps instructor on wraps education for the Roland Academy Workshop program. Location-Based Pricing Strategies B y M a t t R i c h a R t - P R i c i n g S t R a t e g i e S - Landing a large contract job requires lower pricing based on the number of units wrapped, but it also gives your company some security for future work.